Color(s): Lemon and white, red and white, orange and white, black and tan; may be bi or tri-colored. 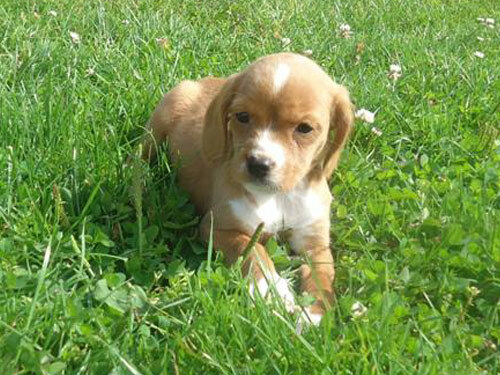 The Beaglier was created by the crossing of two breeds: Beagle and Cavalier King Charles Spaniel. They are often referred to as a "designer dog". They are particularly popular in Australia. Small to medium in size, the Beaglier typically has the shorter muzle of the Cavalier. They do, however, retain the Beagle's Scent Hound ability. Both breeds are avid hunters. Beaglier's have large, expressive eyes, are lively, and athletic. The Beaglier is playful, good natured, gentle, and curious. They are affectionate, calm, and outgoing. They do not do well if left alone for extended periods of time. The Beaglier does best with older, considerate children. They do well with other dogs, but are not recommended for homes with non-canine pets. They make good watchdogs as they will bark to alert their family to visitors or out of the ordinary sounds. Regular brushing is recommended to remove loose and dead hair of the Beaglier. Bathing should be done when necessary. The ears should be checked often and kept clean. They may be prone to epilepsy, ear infection, heart disease, and patella luxation. The coat of the Beaglier may be of medium length, close and hard. It may also be slightly wavy and silky. The Beaglier has a tendency to be stubborn. Early socialization and obedience is recommended. Beaglier's will not respond to harsh or heavy-handed methods. Training must be done with firmness, fairness, patience, and consistency. The Beaglier will do okay in an apartment provided they are sufficiently exercised and properly trained. They are very energetic and require secure ample space to romp and run. They enjoy securely leashed walks and family activities. Due to their hunting tendencies they should never be off-lead in an unsecured area.